sorry for the lag issue for the people how use recording program. I create this gif to show you guys the game in 70% or 80% of the real FPS. Really playable, I like it. I think it'd gain a lot if it was easier to distinguish between background/foreground/osbtacles. Maybe a more progressive difficulty would leave a less frustrating impression also. But nice game, really! 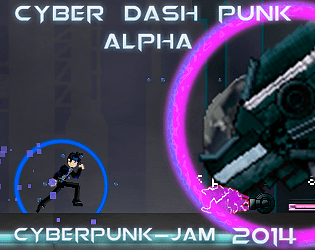 One of the more playable games in the jam, but the character and the orb seem jittery for some reason. It also was difficult at first to distinguish what items were lasers to be avoided and which were just decorative. Cannabalt with a twist. I like! Very tough, nice idea. Background and foreground looked the same so hard to know when to jump at times. Tough game, I love the color changing mechanic. Input key choice is very weird especially 'Left Click' to jump. Cool game! The color thing gets tough. Okay, seems clay.io domain was blocked by my firewall. Just played it, and it's pretty cool. I like the music, graphics and the game plays fast. Nice framerate, very satisfying. Didn't rate because I couldn't get past the start button. Wasn't working for some reason, but from the art on the game page, it looks really nice. Fun game. Liked the visuals, the colour laser swapping. however when I was playing and clay.io achievements started coming. The pause menu comes up. When I click on play the level resets. Moments layer the achievements pop up and pause the game.